"The television is just another appliance -- it's a toaster with pictures." That statement was made by Mark Fowler, Ronald Reagan's FCC Chairman who spearheaded a deregulatory trend that has continued for over three decades. Today, the FCC stands on the cusp of approving a giant deal between Verizon and Comcast/Time Warner that cooks communication competition. Fowler and the FCC have one thing right: with markets like these, consumer choice is toast. Let's review the ingredients involved. Verizon is getting airwaves from the cable companies, and will transfer some of them to T-Mobile. In exchange, Verizon and the cable companies will co-market their services. They're also all going to be working together to integrate wireless and wired products. The Obama administration could have blown up the deal, but the political consequences would have been severe -- and besides, the competitive situation was already terrible, making it unclear how much more harm this particular transaction would add. Like jam on toast, the companies tried to add some sweeteners to the deal to help regulators swallow this mess, and digest its consequences. 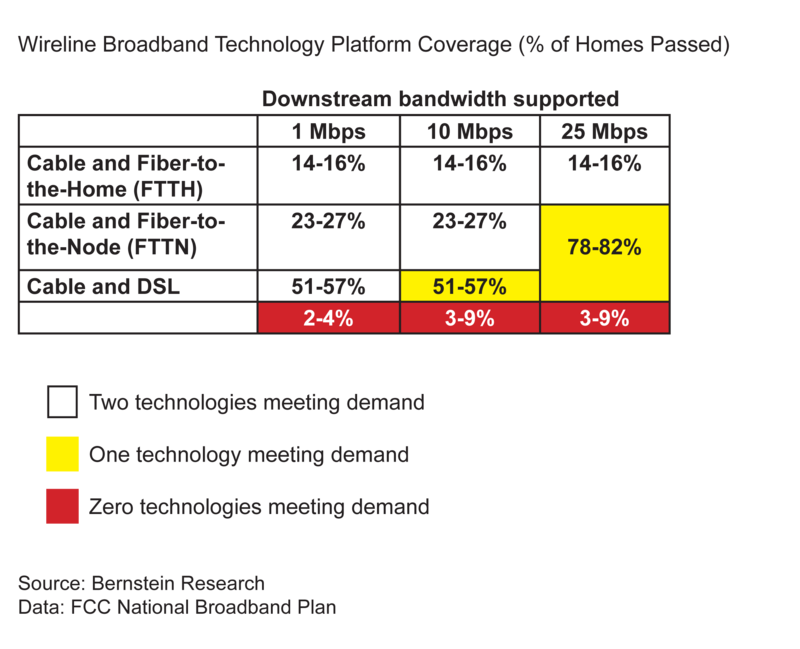 Comcast isn't affected unduly by competition from FiOS, because the two services overlap in only 15 percent of Comcast's territory. And what a territory Comcast has -- by July 2011, Comcast had already won SNL Kagan's designation for "Most Consolidated" markets, with 94 percent of the cable subscribers in San Francisco and 88 percent of the cable subscribers in Chicago. Comcast holds 86 percent of the cable subscribers in its hometown of Philadelphia, and over 85 percent of cable subscribers in Houston. The Department of Justice says it's trying to ensure that Verizon's incentives to build FiOS remain unchanged. So as a condition of the deal's approval, Verizon won't be allowed to co-market cable company products in FiOS areas, and it won't be allowed to co-market at all after December 2016. But what competition does the Antitrust Division think actually exists? Verizon has already said, in effect, "You take wired, we'll take wireless." And with 85+ percent market shares, Comcast can be the gatekeeper for everything in its territories. It's as if we've allowed General Electric to have a monopoly on selling electricity to your home and then allowed them to leverage this advantage into the market for their toasters. Imagine the spiel: "If you buy our GE toaster, you get higher-speed electricity that will cook your bagels faster. But only our bagels fit in the GE toaster." Today, rather than tangling with your tastebuds, Comcast is making decisions that affect what your ears hear, what your eyes see, and what your keyboard can reach. Comcast can give its own video on demand service an advantage via its Internet connections by removing it from the constraints of a monthly data cap. But unaffiliated content like Netflix - that'll cost you extra. It's the price you'll pay because you like a different brand of bread. The FCC is poised to approve the deal in the next few days. Expect broad, hopeful statements about supporting T-Mobile's future with additional spectrum. But Verizon (and AT&T) have such a stupendous lead in spectrum and subscribers, and Verizon's deal with cable will give it such powerful synergistic bundled opportunities, that T-Mobile will have trouble competing in any way that will affect the prices consumers pay for bundles from Verizon. We are stuck in this primitive state with company lobbyists who are buttering up policymakers just to jam consumers. The DOJ has opened a broad inquiry into the practices and powers of the cable industry: that's the good news. As policymakers finalize this gargantuan deal, they should keep in mind that America's economic future needs a diet rich in fiber that enables competition and treats our digital future as something more than just an appliance.